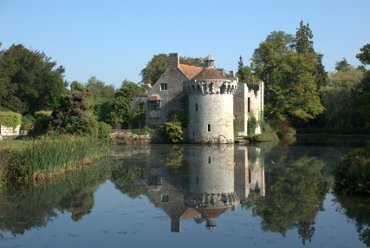 BeenThere-DoneThat: Scotney Castle (1), Lamberhurst, Kent. 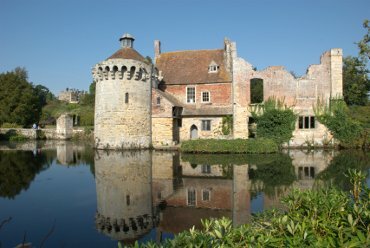 Scotney Castle is a ruined 14th castle together with a moat and gardens. The castle used to be much like Bodiam Castle with a round tower at each corner but only one, the Ashburnham Tower, remains and around 1640 a three-storey east range was added. 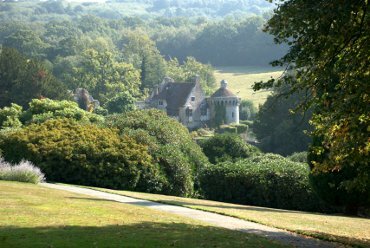 After entering the castle grounds and following the path towards the old castle through a wooded area one soon emerges into the open. Rounding a bend the old castle suddenly comes into view, very often producing gasps of admiration and you can see why. This view shows the sole remaining round tower with the house on its left and the ruined range showing to its right. Luckily when we were here there was no wind to ripple the water producing this perfect reflection. Another view of the old castle showing the tower, house and ruined range but the newer Victorian Mansion can also be seen in the distance on the higher ground. 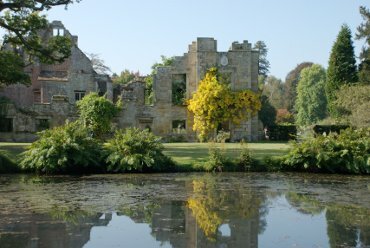 This picture shows the ruined East Range, added around 1640, across the moat and I assumed that the obvious yellow plant was a flower of some sort but after I'd seen it close up it turned out to be bright yellow leaves.